Orisirisi African Folklore shares the beauty of African life and culture through storytelling. With African drumming and dance, spirited call and response songs, and fun-filled audience participation, Moonlight Stories will appeal to the child’s heart in everyone. Orisirisi spins yarns and shares learning experiences that none will soon forget! Orisirisi is performing at all of our branches during Black History Month. Check their schedule here. Check our Happenings for more Black History Month programs at your local library. Bring your DS or Pokémon cards to battle, trade and make new friends or try your hand at a Pokécraft. Ages 6-12. (90 min.) Preregister. Hang out, watch anime, and eat snacks while you talk with friends and fans about all the coolest stuff from Japan. Ages 12-17. (2 hr.) Preregister. Yu-Gi-Oh!, Pokémon, Magic and more. If you like collectible card games, this is your place to be. Bring your deck, box or binder, and come with a friend or make a new one. All ages. (90 min.) Preregister. We will be watching an anime of your choosing to kick us off so keep some in mind that you’d like to watch. Remember, you can bring your own art, manga, video games, or shows to share so don’t be shy! Walk-ins are welcome. . If you like manga, anime, K-Drama, K-Pop, J-Pop, or cosplaying, then this is your chance to meet others just like you. Ages 11-17. (60 min.) Preregister. Do you like to read comics, but keep losing your place? Well, here is our solution: comic book bookmarks! You may draw, color or cut out comics or superheroes to make your very own bookmark. Be sure to bring your creative side! Ages 7-11. (30 min.) Preregister. Test your knowledge of “The Walking Dead” during our trivia event. Form a team, or compete alone, in a ghoulish game of trivia about the hit television and comic book series. Bragging rights and prizes will be awarded to the winners. (90 min.) Preregister. Meet other teens who enjoy watching and talking about anime, eat Pocky and share your knowledge about manga. Snacks provided. Ages 12-17. (60 min.) Preregister. Create a superhero identity, craft, and tackle a few superhero activities as you discover your inner superhero. Costumes welcome. Grades K-5. (60 min.) Preregister. November is Families Reading Together month at the Palm Beach County Library System. Check our Happenings for family programming near you! Test your monster knowledge with a stimulating game of trivia. Form a team or compete alone. Bragging rights and prizes will be awarded to the winners. All ages. (90 min.) Preregister. Hear some great stories and make a fun Thanksgiving craft or two. Ages 5-8. (45 min.) Preregister. Come join us as we read a story, then craft away with one, two, or all three Thanksgiving crafts that are sure to make the holiday a special one! Ages 6 & up. (45 min.) Preregister. Coloring is a calming, relaxing activity, even for adults. Coloring sheets and pencils provided. (60 min.) Preregister. Celebrate the final film with trivia, games and snacks. May the odds be ever in your favor! Grades 6 & up. (60 min.) Preregister. Celebrate Thanksgiving with stories, songs, crafts and a short film. All ages. (45 min.) Preregister. Pumpkins are everywhere! Listen to stories of how they grow, count and sort them and then make a special pumpkin book to take home. Ages 3-5. (45 min.) Preregister. Story Yoga integrates reading with yoga poses. Learn simple yoga as we listen to “The Bear Says Thanks!” Yoga is beneficial for children in learning how to calm the mind, enhance self-esteem, strengthen muscles and increase flexibility. Ages 5-7. (30 min.) Preregister. Calling all little gooblers! Join us for thankful stories and songs to celebrate Thanksgiving. We will also watch a short movie and make a turkey craft. Ages 2-5. (45 min.) Preregister. Enjoy Thanksgiving stories and songs, and make a special craft for your holiday table. Ages 3-6. (45 min.) Preregister. Be proud to be a fan of anime and manga! Join us for anime-related activities and watch anime episodes. Ages 16 & up. (90 min.) Preregister. Pokémon Club: I Choose You! Are you a fan of Pokémon? Then we’ve got the perfect club for you! Get together with other Pokémon fans to play games, make crafts, and talk about your favorite Pokémon. Be sure to bring your Nintendo DS, Pokémon games, Pokémon trading cards, or anything Pokémon related to show off. We’re going to get our Poké-fun on! Ages 7 & up. (45 min.) Preregister. Test your knowledge of The Walking Dead during our trivia event. Form a team, or compete alone, in ghoulish game of trivia about the hit television and comic book series. Bragging rights and prizes will be awarded to the winners. (90 min.) Preregister. According to recent articles in The New York Times and The Miami Herald, adult coloring is gaining in popularity. Enjoy a coloring session with fellow enthusiasts. Coloring sheets containing a variety of paisleys, prints and mandalas, as well as colored pencils will be provided. (60 min.) Preregister. Apples + caramel + candy = a perfect fall evening. All supplies provided. Grades 6-12. Limit 15. (60 min.) Preregister. about manga. Show off your manga drawings, too! Snacks provided. Ages 12-17. (60 min.) Preregister. It’s International Game Day so meet your friends for some Wii gaming and classic board game fun. Ages 12-17. (60 min.) Preregister. It’s a Craft Bonanza – Thanksgiving Style! Witness the impossible as Prof. Kumar, Magician Maharajah of India, presents a humorous and entertaining program of amazing sleights, astonishing illusions, and surprising stunners that will dazzle your mind and leave you speechless. Fun for the whole family. (60 min.) Preregister. beautiful designs and pictures. All materials provided. (60 min.) Preregister. Enjoy Thanksgiving stories, fun songs and a special craft. Ages 3 & up. (45 min.) Preregister. Get ready for turkey day by listening to a Thanksgiving story or two, playing a game and making a cool craft. Grades K & up. (45 min.) Preregister. Here are some highlights from PBCLS’s August calendar. As usual, check out more of our awesome programming in the Happenings. Enjoy a relaxing afternoon playing a variety of classic and contemporary board games. All ages . (2 hr.) Preregister. Here are some highlights from our July calendar. As usual, check out more of our awesome programming in the Happenings. Test your knowledge of superheros by playing a stimulating game of trivia. Form a team or compete alone. Bragging rights and prizes will be awarded to the winners. All ages. (90 min.) Preregister. Immerse yourself in the “Star Wars” universe and take home a craft or two inspired by the epic saga. Ages 6 and up. (90 min.) Preregister. Graphic Novels had an increased role at this year’s ALA Conference in San Francisco. The article below talks about one of the most important topics in the comic book/graphic novel industry right now: diversity. More and more graphic novels are being created featuring diverse characters, but perhaps even more importantly, being created by more diverse authors and illustrators. Libraries have a great opportunity to promote diverse comics, and many are already doing so. 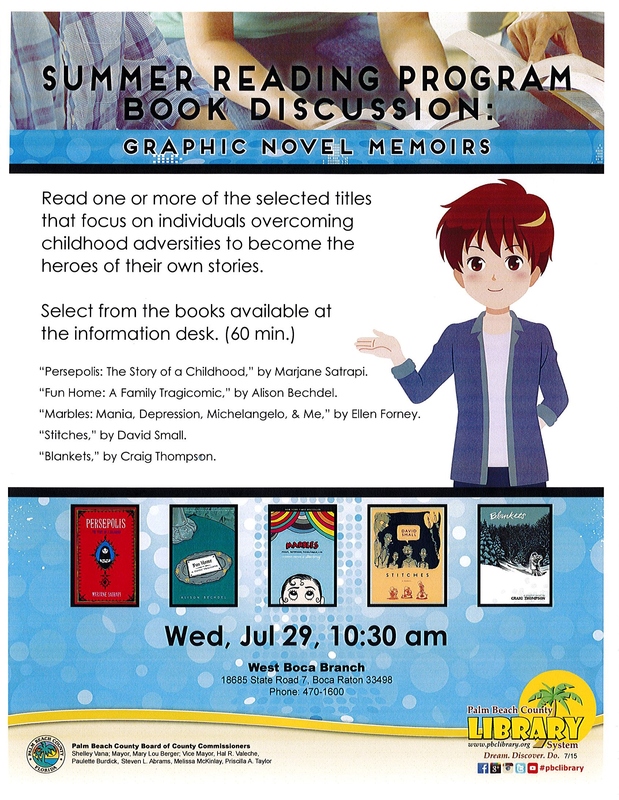 Here at the West Boca Branch Library, part of the Palm Beach County Library System, we are hosting our first graphic novel book discussion centered on the memoir genre. Some of the titles we will be covering include Fun Home, by Alison Bechdel; Persepolis, by Marjane Satrapi, and Marbles: Mania, Depression, Michelangelo, and Me, by Ellen Forney. For more information on our book discussion, including time, titles, and location, please see the flyer below. If you would like to participate in our book discussion, but can’t make it to the library, please feel free to leave comments on this or other related posts. Also, please take a minute to read this article to see all of the hard work and passion for graphic novels from librarians across the country. Happy Fourth of July from PBCLS! Many of our branches are having special 4th of July programs Wednesday, July 1st and Thursday, July 2nd. Call your local branch to see what they have planned.